Today was a good day. I’ll show you in pictures. Left: me, minus 154 pounds. This is what I’ve lost since June 2013, when I began pre-op dieting. Right: me, minus 195 pounds–what I’m down from my heaviest recorded weight. I’m nearly down 200 from my highest weight ever. I am now at the weight that it seems most folks who have the sleeve START at when they have surgery. This is both fantastic to me and distressing at the same time. Fantastic because I never imagined I’d be in this weight range, but distressing because I feel like I still have so much more to go to get to my goal. I am feeling bones in places I have never felt them before, and seeing a body shape that I didn’t realize I had, and I’m wondering if perhaps 170 might be too thin? I guess I won’t know until I get down under 200 pounds, but that isn’t going to happen for a while yet. Spoiled myself today with a pedicure. I took advantage of the warm weather we had today to get this done in advance of a wedding we are going to next weekend. I just hope the weather where the wedding will be is nice enough for me to wear the sandals I’m planning on wearing! I hadn’t had a pedicure since August, when school started. The woman who did my pedicure today did the pedicure I had the day before I had surgery, so she hadn’t seen me since last July. She asked me if I’d lost a lot of weight and I told her that I had, and that I’d had surgery last summer to help me with that. She complimented me on how good I looked and asked me how I felt. I told her I was feeling fantastic, and that I was off my medications. She was happy for me. Being down 150 pounds made getting in and out of the spa chair so much easier, and it made bending my legs to put my feet up for her to do the pedicure a lot easier too. It’s odd how you never think about those things being impossibly difficult until you are no longer the size you were before. Today’s eating was eh. Weekends are tough because I don’t really have a routine or structure unless I know I have to be somewhere. So no breakfast for me, which caused me to have to supplement my protein with part of a protein drink (which I hate doing). I was still under my daily protein goal but only by 2 grams. I got in 78 grams protein, 66 carbs (lots of beans and rice today), and 28 grams of fat, with 833 calories eaten. I drank a gallon of water today. Tomorrow’s eating will be better, but I won’t lie: I have leftover congri, and I’m going to eat some. I also want to attempt making the pollo guisado but I may wait until next week to do it since we are going to be traveling at the end of the week and I’m not planning on cooking too much for the week tomorrow because of that. 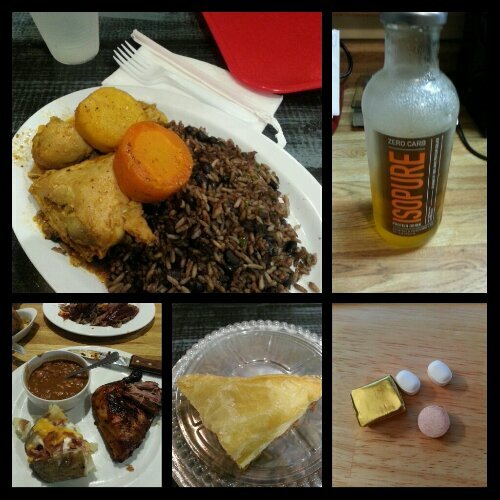 Today’s food choices, from upper right: part of an Isopure; multivitamin and calcium supplements x2, iron supplement; part of a guava pastry; smoked chicken quarter, a little bit of pinto beans, a little less than half of a half of a baked potato; pollo guisado with congri (black beans, rice, bell peppers). 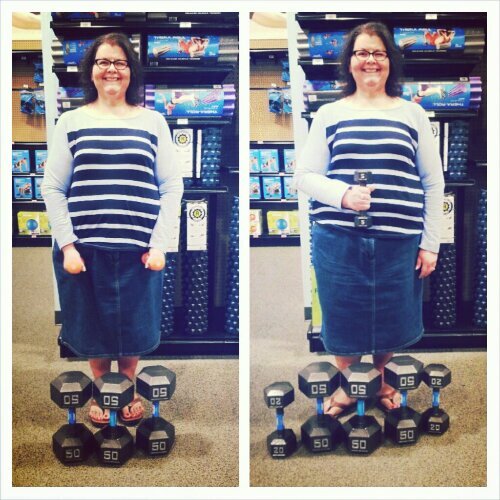 This entry was posted in celebrations, daily bites, eating, la guerra, post-op, success, the sleeve, vsg, weight loss surgery and tagged celebrations, daily bites, omg I eat carbs!, photo post, post-op eating, post-op life, reflections, sleeve gastrectomy, success, the sleeve, VSG, vsg realness, WLS, work in progress. Bookmark the permalink.